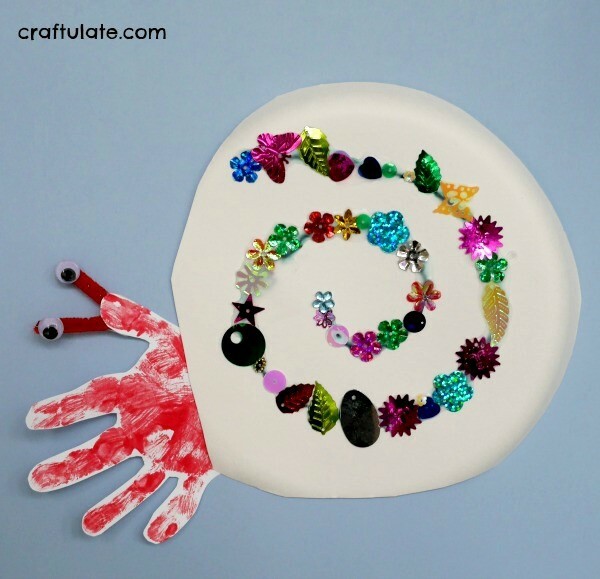 This hermit crab craft uses a paper plate, sequins and a handprint! Paint your child’s hand with the red paint and make a handprint onto the white card. Turn the paper plate upside down and provide your child with sequins and glue to that they can decorate it. I drew a spiral onto the plate so that it looked more like a shell, and F decided to follow the line with the glue! He did very well and I was rather impressed! He then stuck the sequins onto the glue. 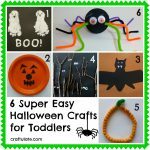 Obviously you could glue on anything you have to hand – buttons, tissue paper, beads, whatever! When everything had dried, I shaped the paper plate, cut out the handprint, and taped them together. I used the wire cutters to cut the pipe cleaner into two small pieces and glued googly eyes to each end. I taped these onto the thumb part of the handprint. 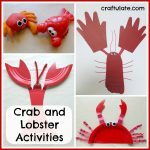 This would be a great craft to go along with the book A House for Hermit Crab by Eric Carle.